The Two of Pentacles is a card about balance - the coins are displayed in a manner that is precarious, any small change in wind or weight can tip and send them falling. For those that may have more coins to go around, they can afford to be less careful, but at this moment things may be tight. Wealth too, is a kind of energy, and it is the kind whose goings in and goings out are easiest and most tangible to see. For those that may have more coins to go around, they can afford to be less careful, but at this moment things may be tight. There is a possibility that you are trying hard to keep the two aspects of your life in a perfect and delicate balance. This could be your career, money, love and health. The balancing act depicted in the card suggests that there are two major factors that you are deeply concerned about. It is time for you to step back to have a better perspective of the situation. While you may initially think it will save you time, multi-tasking may just worsen the situation. Cut down on your tasks and concentrate on these two factors that are troubling you. You've done a good job keeping things stable, for you seem to be able to adapt well to all the changes that ask you to continually re-balance. When it comes to love, the Two of Pentacles is associated with your inability to provide the energy and time required to make your partner happy. Your partnership should be your main priority, but with all the madness in other areas of your life, you are finding it hard to devote your attention to your loved ones. With regards to finances, you should pay heed on the bottom line. You should have a clear picture on your financial state. Plan your finances accordingly, control your expenditures and increase your stream of income to create a solid foundation for your future. In terms of health, this card is asking you to find a balance between your own well-being and your responsibilities. It's easy to make yourself the last priority when you have so many things happening around you. When the Two of Pentacles is in reversed position, it can mean that you are trying to juggle much too many things in your life. You need to take at least a short break to eliminate the stress. In case you are feeling that you can t handle everything, you need to consider your own well-being and provide yourself with a time to breathe. 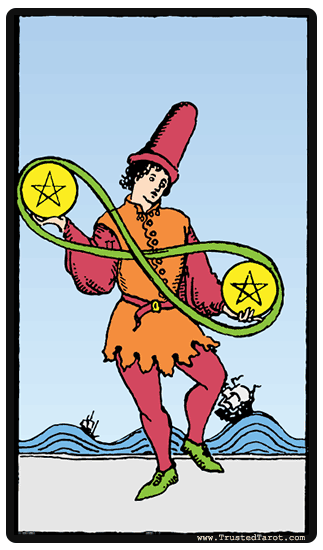 In your work, the Two of Pentacles reversal can be a positive omen. Avoid committing to a lot of things since it will overwhelm you. In your finances, you need to learn how to live in your capacity. The Two of Pentacles reversal meaning reminds you to be aware of your income and expenditures since overspending can become a large issue, especially when you are being pulled in many directions.